Dealing primarily with contemporary and historical Earth nations. (Science-fiction oriented rank systems, such as Star Trek, Starship Troopers, etc. ), should be placed in FICTIVE Rank Insignia. For a short period, there existed a spurious article on Wikipedia dealing with a purported british rank called "Marshal of the Empire". The information contained in the article was bogus and it is now erased. "Marshal of the Empire" was actually a french rank during the napoleonic wars. I was wondering though, let's suppose that the british government after the victorious conclusion of the second world war, had elevated one one of their commanders or the CIGS to the unique rank of "Marshal of the Commonwealth". Is there anyone that has any ideas or perhaps could produce a design sketch of what the insignia of this rank could have looked like? A tricky one as the "Empire" title suggests a level of unified governmental structure and therefore of military service. The Commonwealth, by definition, is an association of States so there could be no one figure who could hold the sort of seniority that the rank would suggest. Might I propose that you re-phrase your hypothetical question to ask "if the [debunked] rank of 'Marshal of the [British] Empire' had existed, what might it's insignia have looked like?" hypotheticaly speaking, for the marshall of the british empire you could simply add a pip in between the crown and batons (like a full general). I guess it would be certainly be possible to modifiy the insignia in such a way as you suggest, so as to end up with something the looks rather similar to the insignia of the Commissioner of Police of the Metropolis but that would not be achieved by simply inserting a pip between the Crown and the batons of the existing Field Marshals' insignia. 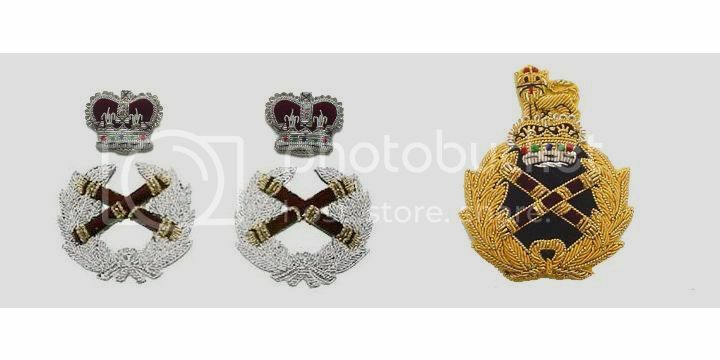 This is because the Crown in the rank marking for Field Marshal is not a "full-size" rank Crown in the same way as that used in the markings for Major, Lt. Colonel, Colonel, Brigadier, Lt. General and General. It is more a component within a unique insignia which is specific to the rank of Field Marshal: crossed Marshals' batons, surrounded by a laurel wreath and surmounted by a crown. British army rank markings are mainly derived from Royal heraldry and badges so, hypothetically, if a unique set of rank markings for "Marshal of the Empire" were to have been designed, I suspect they would have used a variation upon some distinct Royal emblem, possibly incorporating the Royal arms. If such a rank were ever to have appeared then it would most likely have been during the Great War. Brig Gen; Maj Gen; Lt Gen; Gen, Field Marshal; "Marshal of the Empire". Thanks a lot Medic, they look awesome! Marc, your images are no longer visible. Just out of interest, thought you might like to see the bullion cap badge for a Field Marshal and the paired silver bullion rank markings for the full-dress frock coat uniform (to contrast with the gold bullion shoulder knots). They're not the greatest photos - but you get the general idea! > Marc, your images are no longer visible. The title has a great sound. If it were created in World War II, I fear it would have sparked an insignia war with the other Allies, and in particular the United States, which had a time just creating the 5 (and 6) star grades to bring our US senior commanders to par with our British counterparts. I, however, love the idea of a Marshal of the Empire. 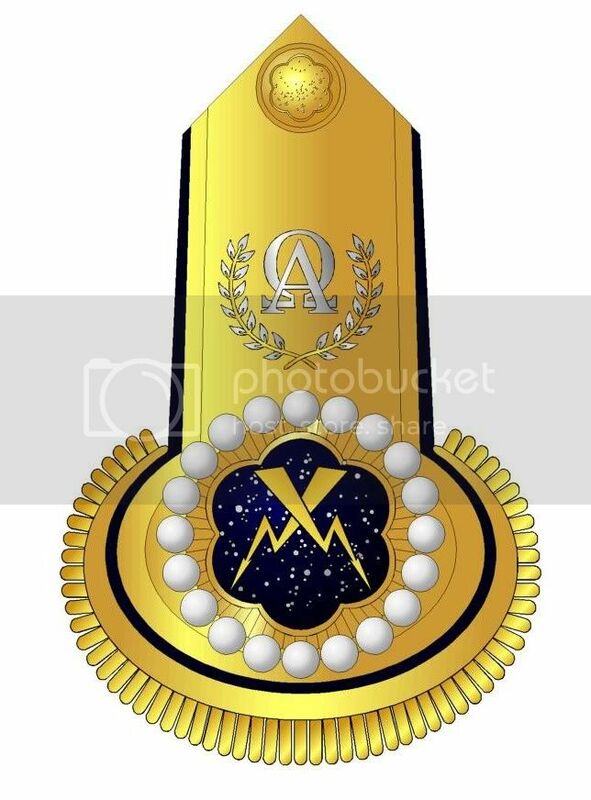 I think the insignia would have to be very different from the beautiful proposals made here. It should incorporate some type of crossed batons, probably a crown as well, but really needs some other device that is larger, distinctive, easily recognized from afar and unique to this grade. Otherwise it will be too complicated and will not stand out. I hope we can get more proposals posted! Yup, I'd agree with those comments. I'm playing with a few different ideas but it's actually rather hard to come up with something that fits the sequence and uses recognisable emblems but is still truly distinctive without being overly complex. I'm sticking to the concept of the World War One era as I still believe that if this was likely to have been seen at all then that would be the most likely time. When I have time, I'll draw them up properly and post a range of ideas. I can't wait to see what wonderful ideas you will present! Can't wait to see this! I might add that this discussion reminds me of the very subject that the Congress worried about in their debates on creating the 5 and 6 star grades originally. That is, the back and forth elevation of senior officers between British and American, each outdoing the other, with titles ever-increasingly grandiose. I think it is great however. After Grand Admiral of the Empire, how about Supreme Grand Admiral of the Empires. Just kidding! Hmmmm. Yes, I can see how this "Ranks Race" could all get just a little bit silly. ...does God have rank markings, I wonder...? Surely the Almighty must use crossed lightning bolts on clouds of Glory over a star field of unlimited stars!! ELSUPREMO wrote: Surely the Almighty must use crossed lightning bolts on clouds of Glory over a star field of unlimited stars!! Actually, that sounds a lot like the markings Zeus (Jupiter) would wear. Now, how about Mars, Neptune et al...? well The Almighty is THE Supreme Commander after all! Venus? Not sure, too much cloud cover! Full bullion-fringed dress epaulettes - of course! FANTASTIC! I am so glad I inspired you. You are a graphic genius!! I wonder if The Almighty wears subdued when it rains?? But surely, it never rains on the Almighty...? I really must do something more useful with my time (!). I actually got faint with glee looking at the fulfillment of this concept! BRAVISSIMO!!!! In regards to Venus, I was referring the cloud-covered planet, but you surely were referring to the Greek Goddess. One can only hazard to guess what visual feast you would prepare for her insignia! Medic_in_Uniform wrote: But surely, it never rains on the Almighty...? OK - its begun again -- now we all MUST see the FULL range of Divine Insignia, all services all countries --- after all every combatant regardless of country always say God is on their side! Ha! One aims to please...!! What can I say...? This is, after all, the "Hypothetical Ranks" area of the forum! El Supremo's description just created such an obvious mental image of what this should look like that it was impossible not to have go at drawing it! Inevitably, there are loads of potential variations on this concept (e.g. some rather more Greco-Roman looking thunderbolts and an overall more archaic/classical design) but this one using extant symbology from the US arms was by far the most obvious of the ideas that sprang to mind! I'm not sure who's more sad; me for actually drawing this up or you lot for being amused by it! Not exactly, I just figured it would be wrong NOT to use gold-faced shoulder-boards...! ELSUPREMO wrote: OK - its begun again -- now we all MUST see the FULL range of Divine Insignia, all services all countries --- after all every combatant regardless of country always say God is on their side! So much for me having a *REAL* life then. Anyone else with an artistic bent, do feel free to chip in...! Where are Justin and Ryan when you need them?! Truly you have done a great artistic job, and I very much appreciate the labor and time it has obviously taken to bring these descriptions to life! After all, isn't the purpose of the forum to discuss any and all topics related to insignia, regardless of how strange, hypothetical or wonderful they might be or are? I, for one, look forward to continuing the quest for new and fresh ideas, especially the hypothetical ideas, particularly because often the official designs chosen are rather bad. I have always sought out the proposals and the rejected projections. They show the thinking minds involved, and these trashed ideas often inspire me even more than those actually used! Well, with that in mind, I'll make sure to post a sequence of designs that shows the evolution of my thinking for the "Marshal of the Empire" insignia. It is sometimes very interesting to see the ways in which design ideas develop - and to wonder why some versions are rejected and others go on to be adopted for use. EXCELLENT! That way, a rejected idea might inspire an entirely new approach. What kind of software do you use for your artwork? Wow I appreciate the compliment. I have some ideas for at least one State that didn't have "God" on it side but more the opposite "power"
I can't wait to see what you have in mind! Here are some updated images in respect of the original question. I've extrapolated somewhat from my original postulation (see posts above) and I've also included some images of khaki service uniform versions as well as more formal uniforms. The development of this one idea was that most British military rank insignia are derived from the symbology of Royal heraldry There is no British "National coat of arms" - the Monarch is the State and, therefore, the State's arms are the Monarch's arms. With that in mind, I was looking for something that maintained the emblems of a Field Marshal (e.g. the use of the baton as an integral symbol within the insignia) but expanded on the concept of the hypothetical "Field Marshal of the Empire" as effectively being the representative of the Monarch, who is the titular Commander-in-Chief. The trick was to find something that added to the existing insignia of a Field Marshal and was distinctive enough to be different but also wasn't overly complicated. Equally, I wanted to avoid something that looked too much like the existing cap badge of a Field Marshal and remained separate as a distinctive rank marking. For the record, I still really like the versions that appear second and fifth from the left and either of these could conceivably have an alternative use (albeit in slightly modified form) as a cap badge for the new rank but, overall, it seemed reasonable to assume that both "grades" of Field Marshal would continue to use the same secondary uniform accoutrements, much as all grades of General Officer use the same cap badge, etc. There are obviously many other potential concepts but this is simply the progression of this one idea. For comparison, the existing insignia of a Field Marshal is shown on the right of the picture. Another beautiful job! As I poured over the concept drawings, I was struck by several things. The use of two crowns, one on the lion's head and the other as a separate device reminded me that by convention, only one crown should be used on a given shoulder strap. The only two exceptions I have ever seen are those of Field Marshal Douglas Haig from WWI who wore two crossed batons in a wreath with a crown on the wreath and then a separate King's crown, and Kaiser Wilhelm II who, as Grand Admiral of the Imperial Navy, wore both the German crown and the Prussian crown. In regards to the devices for Marshal of the Empire, I would suggest trying to come up with something very simple, different than Field Marshal, and that is striking and dramatic from a distance, but not complex. I realize this is a daunting task, but who better to execute it! Medic_in_Uniform wrote: Where are Justin and Ryan when you need them?! You have things well in hand. And I've already blasphemed enough in my life! I like the studies for Marshal of the Empire. That is a big task, since the field mashal insignia was already somewhat unique and special. Isn't it great to see all this imaginative energy at work! ELSUPREMO wrote: Another beautiful job! As I poured over the concept drawings, I was struck by several things. The use of two crowns, one on the lion's head and the other as a separate device reminded me that by convention, only one crown should be used on a given shoulder strap. The "crowned lion" is a complete symbol in it's own right so doesn't really count as a "second" crown - and in this case it's an integral element within a larger insignia rather than a stand-alone. I take your point though - and I agree; as a general rule it just looks wrong within a British-type system to have more than one full-size crown. The only two exceptions I have ever seen are those of Field Marshal Douglas Haig from WWI who wore two crossed batons in a wreath with a crown on the wreath and then a separate King's crown, and Kaiser Wilhelm II who, as Grand Admiral of the Imperial Navy, wore both the German crown and the Prussian crown. I can understand why Wilhelm II would wear those two crowns specifically - they were, after all, both his crowns to wear! I guess that constitutes a legitimate, if rare and unusual, reason! As to why Earl Haig would wear a second crown above that of his Field Marshal's insignia, I genuinely have no idea - I'm not aware that that was ever an authorised insignia. The only thing I can think of is that I have seen some rank charts from the period where the Royal Cipher is shown to appear between the batons and the Crown, rather than below them which is current practice. This would certainly give the appearance of two crowns. Do you have any pictures of this you could post? In regards to the devices for Marshal of the Empire, I would suggest trying to come up with something very simple, different than Field Marshal, and that is striking and dramatic from a distance, but not complex. I'm not sure it necessarily needs to be all that "striking" - although I concede the point on distinctive. What I plan to do is start again with a blank sheet and add in all the individual components that might go into such an insignia and then "re-assemble" them anew to see if I come up with anything different. 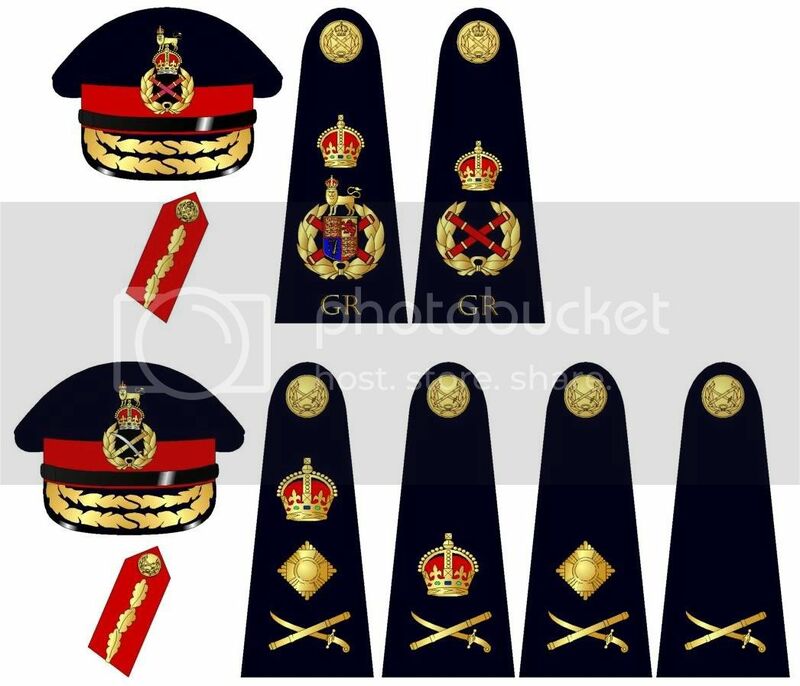 The traditional "pip" is based on the star of the Order of the Bath so for this I thought I might consider stars based on the Order of the Garter or use other similar items (the Garter itself is up there with the Royal arms in some of the designs shown above). I'll let you know what I come up with! Alternatively, if you have any ideas or inspirational suggestions then do let me know and I'll have a go at adapting them and drawing them too! I realize this is a daunting task, but who better to execute it! J.T. Broderick wrote: I like the studies for Marshal of the Empire. That is a big task, since the field mashal insignia was already somewhat unique and special. Thank you! 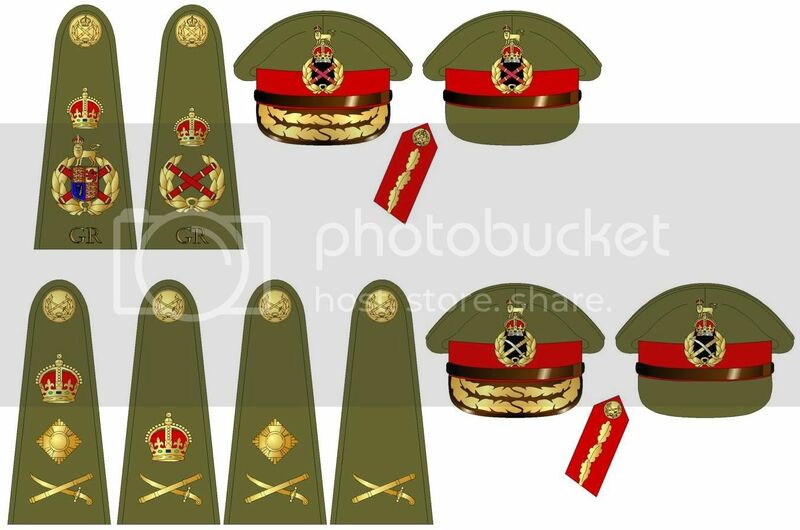 I too like the simplicity of the British insignia for Field Marshal; after the progressive escalation of additional insigna components up to the rank of General it's actually quite nice to have a simple and cohesive single insignia for the top grade instead of some huge conglomeration of lots of different bits. 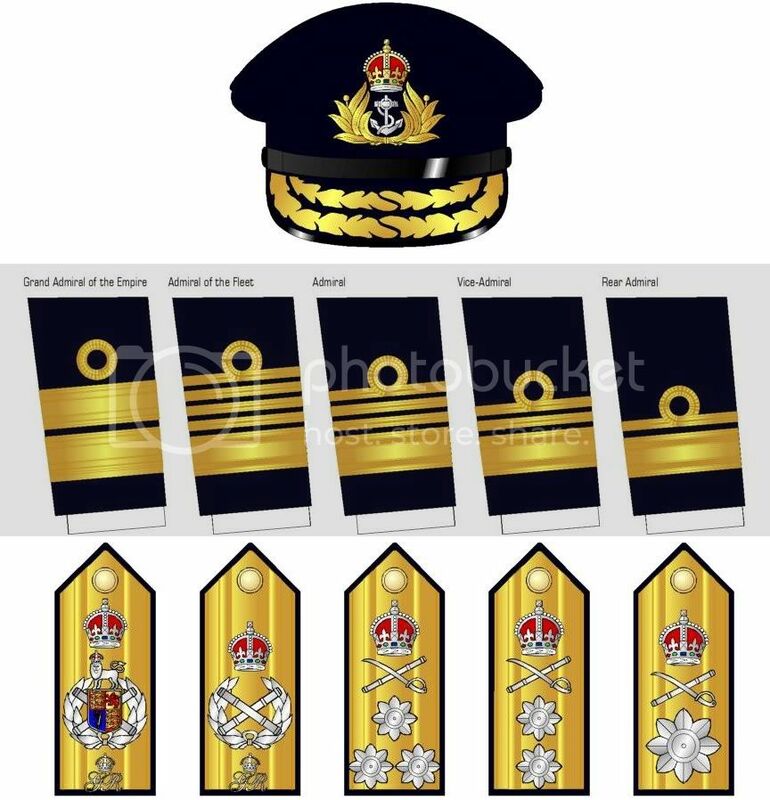 Part of my thinking for the "Marshal of the Empire" design is to come up with something that would easily be transferable to a gold Royal Navy shoulder-board for an equivalent "Grand Admiral of the Empire" rank in the same way that the boards for Admiral of the Fleet carry much the same insignia as that for Field Marshal. All I need to do is consider which option of sleeve lace to go for... (sounds like the USN 6-star debate all over again!). Although I just love all of this debate and exchange of ideas, I think we are sinking into the quagmire of the 6-star problem again. Don't get frustrated, as this is supposed to be great fun. And it is, passionately so! In regards to the second crown of FM Haig, I suffered the research of poor fuzzy period black and white photographs of him in uniform for too many years. Then, a gift from fate, I was standing in front of his uniform in a display case in the military museum in Edinburgh, Scotland. There I was face to face with the military remains of FM Haig. Yes, I personally saw the crossed batons in the wreath with a distinctive crown at the top of the wreath, and a separate Imperial Crown above this batons device. Whether or not this was consistent with any regulations of the period or not, I do not know. But there it was, and as I have repeatedly stated in many earlier posts, often the map is not the territory! As far a Wilhem II goes, yes he could wear anything he desired, and apparently did so, but convention has always favored the wear of but a single crown. Lets keep all of this in the perspective that I was only reminded of this when I saw the small crown on the Lion's head along with the separate crown in the hypothetical drawings. I was certainly not trying to draw a direct parallel. In the final analysis, simplicity of design will prevail as the superior design for well executed insignia, and I think Marshal of the Empire or any at that level will benefit from simplicity. A new unique device might be the way to go. Perhaps that new unique device, not yet described, alone or along with the crown might be best. Perhaps trying something distinctive but different is the best approach, as that way one won't get lost trying various combinations of the devices already used, which might be causing a mental log jam or visual confusion. The three criteria for good insignia design are simplicity, simplicity and simplicity! Don't worry - not frustrated at all! It IS good fun! Just a thought: I wonder if it's possible that Haig's uniform was altered or "repaired" before going into the case by someone who didn't know better? It's been known to happen...! I might be in Edinburgh soon so I should go visit myself as I'd be genuinely interested to see it! No repair or alteration. The metal badges are clearly unchanged originals from the period and quite beautiful. They might not fit the expectation for Field Marshal, but that is the beauty of the discovery in that I was in awe of the differences from what I had expected and very much enjoyed this discovery! It was very difficult to take good photographs due to the glass case and the position of the uniform in it. Perhaps better equipment would have allowed for better results. I was, of course, not prepared for an insignia discovery of this magnitude, so I didn't have the right camera. If you go, please take something that will work in low light and reflective glass. Does someone have pictures of Wilhem II special insignia mentioned above? Would be interesting! A wonderful and comprehensive color photograph collection of Wilhem II uniforms and closeups of his shoulderboards (he had many different sets) were published in the early 1980s in a hard cover book on World War I German helmets. It was long ago, and I have forgotten the title of this probable out of print book. However, a little research or correspondence with his former home, now a museum in Doorn will doubtless yield positive results. Following the same logic as above, I would postulate this design as one possible form of insignia for a hypothetical Royal Navy "Grand Admiral of the Empire" in the early years of the twentieth century. If I do manage to come up with a better, more distinctive version of the insignia, I'll update both the military and naval ranks. In the meantime, enjoy...! Beautiful art for such a conjectural topic. This is great. Keep it coming! 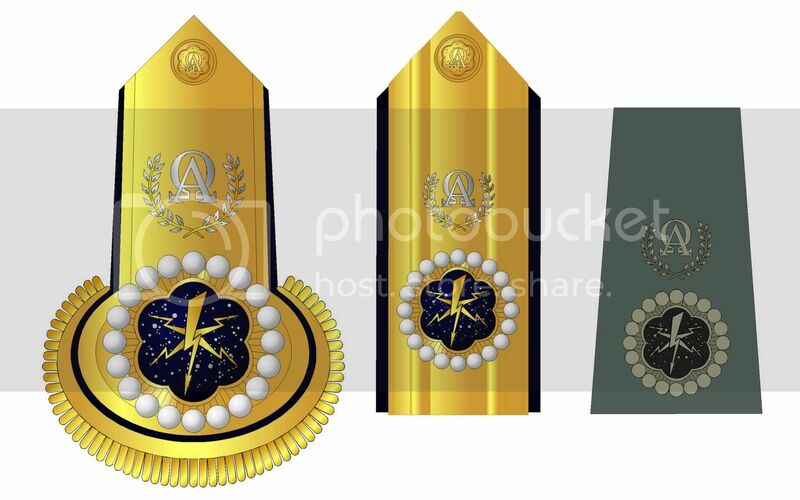 I'm still playing with ideas at the moment but I thought one or two of you might like to see what I've drawn in the last few days so here are some more variations on a theme for the hypothetical Marshal of the Empire and also the corresponding Grand Admiral rank. The Grand Admiral cuff distinction lace presents some interesting choices - should they simply be the same as those of an Admiral of the Fleet (as was the case with the similar German rank)? Should they be very different? 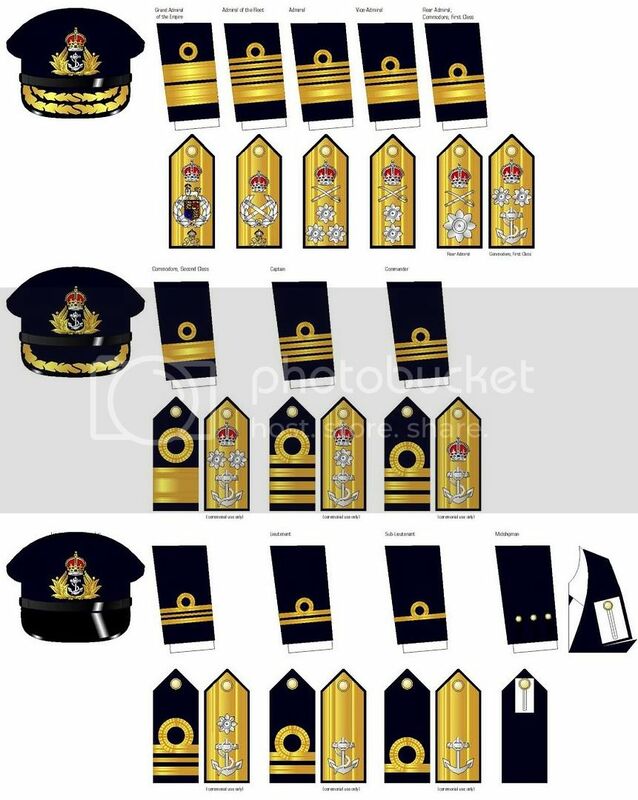 Should I consider including additional insignia over and above the gold lace alone, even though it's not really in keeping with the traditional insignia of the Royal Navy? 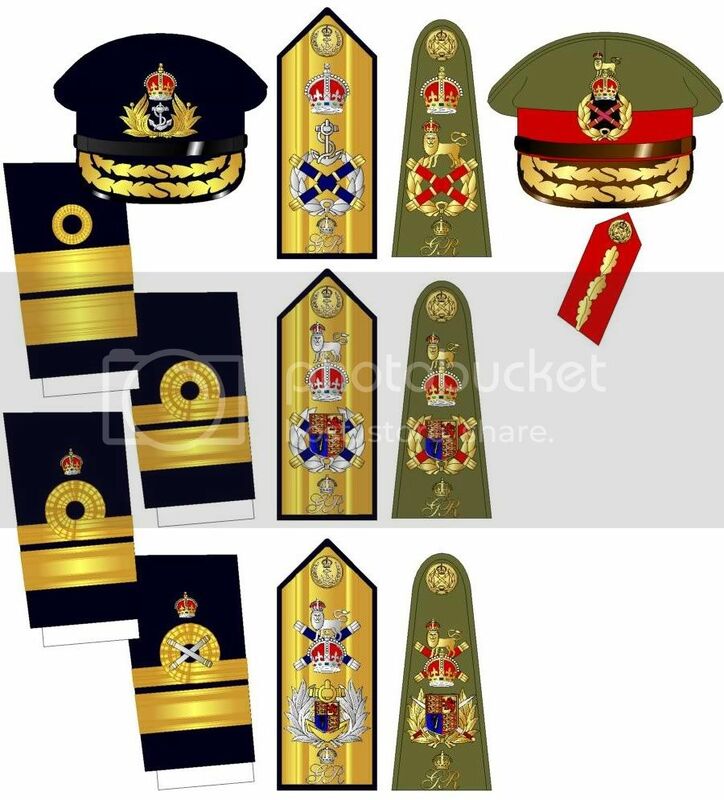 Anyway, here are the pics and also a rough chart of contemporary RN ranks so you can see how the various Grand Admiral options would look alongside them (yes, the chart is incomplete (executive branch only) and, no, the ceremonial shoulder-boards shown aren't quite the same as the historical full-dress epaulettes!). More great artwork! Many thanks! Seeing your images does exactly what I had hoped: it stimulates the imagination to create still more designs. Looking at your creations, I see much complexity and perhaps visual distraction, so I have been thinking that the basic rule of simplicity might now be tried. First, I do like the sleeve lace for Grand Admiral, the two wide rings. Consider a ring of oakleaves between the two extant rings. I think the crossed batons in the upper loop is nice, but reminicent of The Netherlands, where the Sovereign wears very similar. For the shoulderboards, I do like the large blue crossed batons. But, I would try the large blue batons with the Imperial Crown placed at their intersection, and no additional crowns, and, if a shield is necessary, perhaps the shield in a wreath beneath the crossed blue batons. I am constantly reminded that this should be visually distinct from Admiral of the Fleet, so consider using just the large crossed blue batons (larger than those of Admiral of the Fleet) and the crown in their center, and the Royal Cyper separated from them. Eliminate the wreath altogether. It is just too much to include, is too similar to Admiral of the Fleet, and only serves to add additional complexity to an already complex design. Further, try very large blue crossed batons along the length of the shoulder mark, and in their center intersection place an Imperial Crown or a crown in a wreath. This way the batons are the dominant emblem and the wreathed crown still points to the Imperial symbol and the wreath is included. Another approach might be to place the fouled anchor in the center of the crossed large blue batons, above which is the Imperial Crown, and below which is the Royal Cypher. Much simpler, easily identified at a distance by both design and color. Similar concepts run through my mind for the Marshal of the Empire. Perhaps larger and more colorful will trump detail and complexity on the path to resolution of this design problem. OK, these are versions of the insignia that I'm now pretty happy with and which feel and look more like I wanted them to. Thanks for your input, El Supremo - you and I were starting to think along the same lines on this! As you say, simple and bold is good. I wanted something that fit with the existing patterns and didn't look out of place but was also distinctively different. As the designs progressed, I also felt that I wanted the military and naval versions to parallel each other but perhaps also have something distinctive for each service - I think I've now achieved what I set out to do. The two hypothetical ranks, with the other senior ranks for comparison and then all the RN ranks together for comparison of the sleeve stripes. Sadly, this will be my last posting for a while as I have serious work that I have to get on with for the next few months - and can't afford to spend my time doodling uniform insignia, fun though it is...!! I'll see you all in a little while and I hope the discussions are alive and well at that time! Best wishes to you all!